The Sierra Triple Bunk Bed by Dorel Living is designed to accommodate three twin size beds, making it a safe, fun and common sense sleeping solutions for large families . 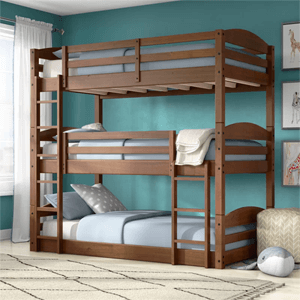 With a sturdy solid wood construction, the Sierra Triple Bunk Bed features two built-in ladders to access the upper bunks and guardrails to ensure no falls occur during sleep. The ultimate space-saver, this triple bunk bed really amps up the fun factor while leaving parents completely worry free. Sleep three in style with the highly customizable, space-saving design of the Dorel Living Sierra Triple Bunk Bed. The increased sleeping capacity is a common sense solution for cottages, extended family, out-of-town visitors or hosting your child’s rambunctious friends for a sleepover. The Sierra features a mocha finish, clean lines and horizontal slats with two built-in ladders to access the upper bunks. Each bed boasts its own personal space with easy, dependable access in and out. The ultimate space-saver, Sierra’s multiple configurations also allow it to be set-up as a triple bunk bed, a bunk bed and a daybed, or simply three twin beds. The unique floor bunk bed design will allow you to maximize your space while the sturdy, solid construction adds both durability and functionality. Fun, safe and stylish, the Dorel Living Sierra Triple Bunk Bed is the perfect antidote for sleeping several people in smaller spaces. Distributed Weight Capacity is 165 Lbs per section of the bed.